Golden, British Columbia is a great, low-key place to set up your base camp for exploring the Canadian Rockies’ many beautiful parks, including Banff, Jasper, Kootenay, Mount Revelstoke and Yoho. 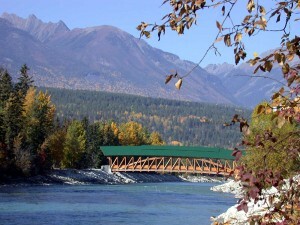 Golden's famous walking bridge on the Kicking Horse River. The town is situated on the border of B.C. and Alberta, about a 3-hour drive west of Calgary, or a 9-hour drive east of Vancouver. From Golden, you can access Lake Louise or Glacier National Park in an hour, Banff in an hour and a half, Revelstoke in less than two hours, and Jasper in four hours. Golden sits between the Purcell Mountains and the Canadian Rockies, and at the junction of the Columbia and Kicking Horse Rivers. Sitting on the borders of such powerful natural forces has blessed Golden with amazing scenery you don’t have to leave town to see. As you can imagine, people who visit fall in love with Golden. But the people who call Golden their home maintain a sense of awe, as if it were still their first day in town too. And, she says, you don’t have to be a local to tap into the “real” Golden. “Even as a guest, people find that they’re able to chat with people that have lived here a long time,” she says. She says her guests are often surprised to find themselves not just among other tourists, but skiing, rafting, or sipping a beer with locals. For people visiting Golden, this means they’ll often get great advice on hikes, ski runs or just great places to grab a good burger directly from locals, even if they’re just here for a few days. Katherine Wilson is another local smitten with the town. She moved to Golden three years ago, and currently manages regional marketing and sales at the Prestige Mountainside Resort in Golden. For her as well, Golden’s residents figure greatly into the beauty of the town. Wilson says she grew up in a much larger city, and finds living in Golden to be the perfect retreat from a hectic lifestyle. A teepee at the Goldenwood Lodge near Golden. There’s certainly a lot for local and visiting outdoors enthusiasts to love about Golden. The area offers up some of the finest access to recreational activities the Canadian Rockies offer, including hiking, skiing, snowboarding, snowmobiling, golfing, fishing and, once you’ve sampled some of these activities, relaxation. Wilson says Kicking Horse Mountain Resort is one of her favorite things about living in Golden. She notes that the terrain on Kicking Horse is particularly challenging. “It’ll make you a good skier,” she says. No matter what time of year, Wilson recommends going to the ski mountain. Winter or summer, it’s possible to take the gondola to the peak, where, she says, the views are fantastic. “That’s just got to be seen,” she says. In town, Wilson recommends checking out the walking bridge over Kicking Horse River, especially in the summer, when kayakers and rafters are shooting beneath it. “If you enjoy the outdoors and see what this place has to offer, it’s pretty amazing,” she says. Wilson also recommends a hike at Gorman Lake, just west of town. Macisaac says she loves the wide range of recreation available to visitors and locals, including mountain biking, whitewater rafting and even paragliding, which a beginner can try off of Mount 7, flying tandem with an instructor. “It’s very diverse,” she says. Just as there is a multitude of things to do and see in and around Golden and British Columbia here in Western Canada, there is just as many different types of accommodations one could ask for. 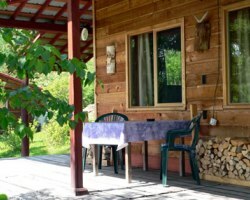 Looking for a rustic cabin in the alpine wilderness with snow-capped mountain peaks in the background? Or would you rather be pampered at an upscale resort lodge or boutique hotel? Or perhaps something in between? You can find just such a place in or near Golden. It’s the perfect place for a weekend getaway, holiday, or a weeks-long vacation. Click here to search for and book your Golden, British Columbia hotel or other accommodations.